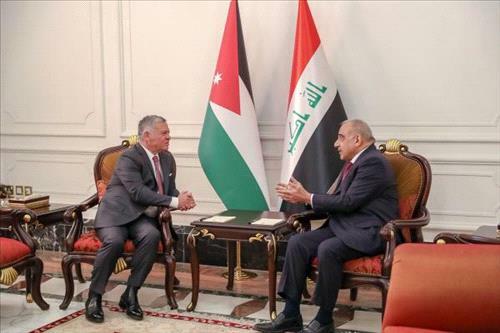 AMMONNEWS - Iraqi Prime Minister Adil Abdul Mahdi said on Monday that His Majesty King Abdullah’s visit to Iraq has a major domestic and regional impact. Speaking during talks with King Abdullah in Baghdad, Prime Minister Abdul Mahdi noted that His Majesty’s visit signals the start of a new phase in Iraq, stressing that Jordan has historically had a special place in the heart of Iraqis. "Jordan is the lung of Iraq, and Iraq is the lung of Jordan," the prime minister said. Talks focused on ways to expand cooperation under recently signed agreements, with the King and the Prime Minister Abdul Mahdi agreeing to bolstering cooperation in the economic, trade, and investment sectors. Discussions also covered the importance of Prime Minister Omar Razzaz’s recent visit to Baghdad along with a ministerial delegation, and the two sides noted the need to exchange visits among public and private sector representatives in Jordan and Iraq to broaden bilateral cooperation and spearhead joint investments. His Majesty and the Iraqi prime minister called for moving ahead with a number of joint economic projects, particularly the Basra-Aqaba oil pipeline, revamping the Amman-Baghdad road, and establishing a joint economic zone in the border area. In addition, discussions tackled the importance of increasing trade exchange, removing obstacles to the flow of Jordanian goods into the Iraqi market, and capitalising on investment opportunities in the two countries. Prime Minister Abdul Mahdi expressed appreciation for Jordan’s support for Iraq’s security and stability, while the King affirmed that Jordan will continue to stand by the Iraqi people in their efforts towards further progress and prosperity in their country. Talks also covered regional developments and crises, with the two sides stressing the importance of maintaining coordination and consultation in service of mutual interests and Arab causes. Moreover, efforts to fight terrorism were discussed, with His Majesty commending Iraq’s role in this regard. An official welcoming ceremony had been held for the King at the Government Palace, where Iraqi President Barham Salih also hosted a luncheon in honour of His Majesty and the accompanying delegation, attended by Prime Minister Abdul Mahdi and senior Iraqi officials.